For Christmas, John got Ad Hoc by Thomas Keller. It’s a bear of a book, but fun to look at and read. It’s full of staples and comfort foods. But the foods in this book take a long time. A really long time. The first thing we made from this book was braised short ribs and celery root with melted onions. I didn’t blog about it because 1) I forgot to take pics and 2) it took a damn long time. Like, all day. Almost every recipe in this book has a component with a recipe on another page. So you’re flipping back and forth between different pages in this book and cooking and cursing and mincing and perhaps stepping on the puppy, because he’s so small and gets underfoot. I’ve got nothing against the slow food movement, I just thought I’d warn you that this dish takes a long time. I started cooking at 3pm. We ate at 8pm. There were a few things I changed here, and things that you can cook simultaneously. I would advise you make the tomato sauce first, since it’s in the oven for a long time. Or you can make the sauce days before. It keeps for up to a week in the fridge. Cut a rectangle of cheesecloth. Lay the spices on the cheesecloth and fold over. Tie with kitchen twine. Combine oil, onion, leeks, fennel and garlic in large Dutch oven and sprinkle with salt. Put in oven and cook for 45 minutes to 1 hour, until vegetables are tender and beginning to caramelize. Stir in the brown sugar and vinegar and return to oven for another 20 minutes, until liquid is absorbed. Remove from oven. Meanwhile, drain the canned tomatoes and remove the seeds. Coarsely chop half of the tomatoes. Puree the other half. Add the tomatoes to the vegetables along with the sachet, season with salt and pepper to taste, and return to oven for 1.5 hours, stirring every 30 minutes. The sauce should be thick and have a full, rich flavor. Sauce should be thick. The sauce will be very very thick. You might be tempted to thin it out, but don’t. It tastes awesome. Discard the sachet and let the sauce cool to room temperature. In a small pot, heat an inch of canola or peanut oil until 350 degrees. Drop the oregano sprigs in the oil. After a few seconds, remove the sprigs and drain on a paper towel. Heat the canola oil in a large saute pan over medium heat. Add the onion and garlic, season with salt and pepper, and reduce heat. Cook gently for about 20 minutes, to soften the vegetables without browning them. Remove from heat and set aside. Meanwhile, trim any sinew from the meat. Cut all of the meat into 1 inch pieces and place in a bowl. Toss with 1 tbs of salt. Set up a meat grinder with a 3/8 inch die. 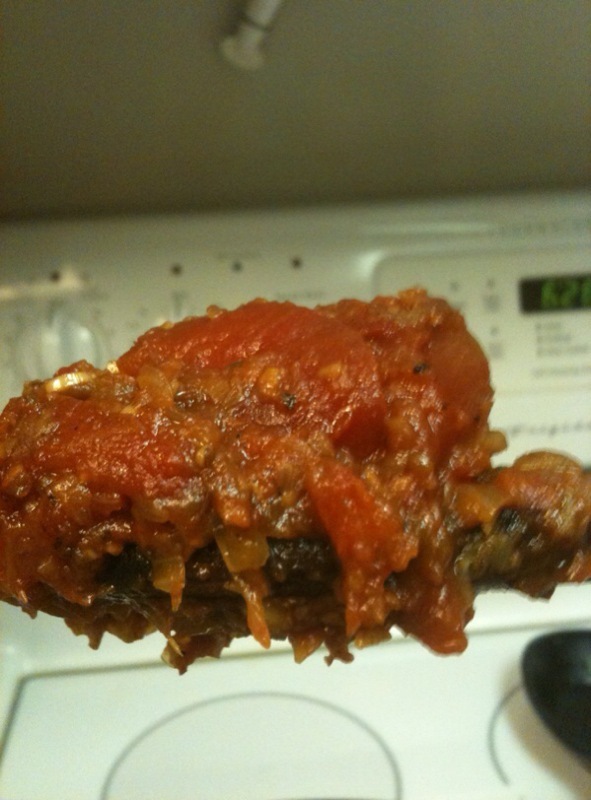 Fill a large bowl with ice water and nestle a smaller bowl into it to catch the ground meat. Grind the meat, alternating the types of meat. Change the die to 3/16 inch and run the meat through again. Add the onion and garlic, bread crumbs, 2 tbs of the parsley, and the egg to the meat and mix gently to incorporate evenly (do not overwork). Divide mixture into 12 equal balls, using a scant 1/2 cup for each. We wound up with 9 meatballs. Cut the cheese into 12 cubes, about 3/4 inch. Shape the meatballs, stuffing a cube of cheese into the center of each one. Preheat the oven to 425 degrees. Set a cooling rack over a baking sheet. Put the meatballs on the cooling rack and bake for 15 to 18 minutes, until cooked through but still juicy. Remove from the oven and let rest on the rack for a few minutes before serving. Meanwhile, cook the pappardelle. Drain and put in a large bowl. Toss with the melted butter, the remaining 1 tbs of parsley, and the lemon juice. Spoon the tomato sauce into a gratin dish or shallow serving dish. 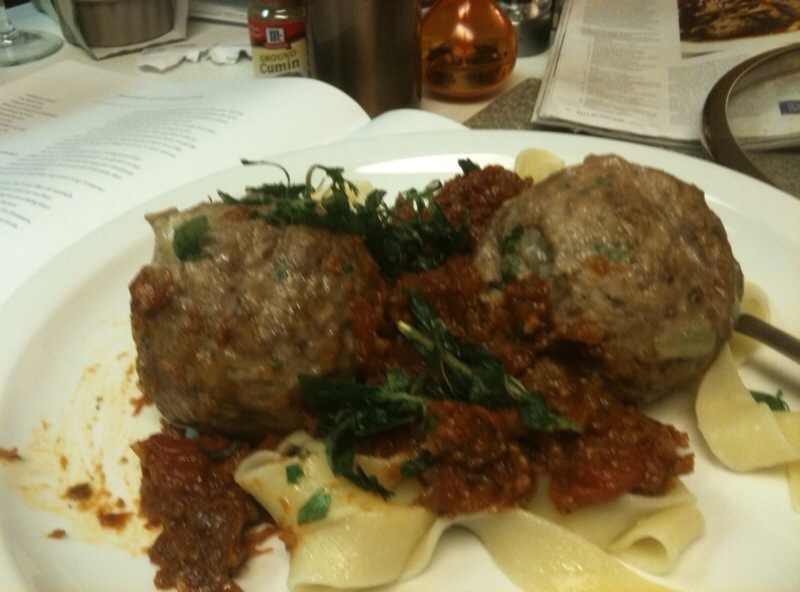 Top with the meatballs and garnish with the oregano. Serve the pappardelle on the side.